Didymograptus 'bifidus' from the Ordovician of South Wales. About 2 cm long. 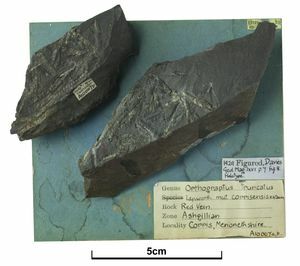 Fossil graptolites are thin, often shiny, markings on rock surfaces that look like pencil marks, and their name comes from the Greek for 'writing in the rocks'. Graptolites are the remains of intricate colonies, some of which accommodated up to 5000 individual animals; these individuals lived in a skeleton of collagen, similar to the material from which our finger nails are made. We focus on the two main groups of graptolites: the cone-like, largely bottom-living dendroids, and the planktonic graptoloids. They lived between the Cambrian and Carboniferous periods, about 520 to 350 million years ago. Didymograptus, a tuning folk graptoloid, showing the main parts of the rhabdosome. Graptolites were colonial animals that lived in an interconnected system of tubes. From an initial 'embryonic' cone-like tube (the sicula), subsequent tubes (thecae) are arranged in branches (stipes) to make up the whole colony (rhabdosome). Climacograptus has 'box-like' thecae and a long spine (virgella) extending down from the sicula. A close-up of the thecae of Climacograptus partly cut away to show the internal structure of the interconnecting tubes and one of the zooids. The thread-like, central nema (or virgula), which may protrude some distance beyond the stipes, may have been used for attachment when juvenile, for strengthening or to attach a floatation device or vane. The cone-shaped sicula and first thecae of the biserial Ordovician graptoloid, Amplexograptus maxwelli (3 mm long). A close up of one of the Amplexograptus maxwelli thecae showing ring-like fusellae crossed by faint traces of cortical bandages. Thecae were constructed in two layers made of collagen: an inner layer of many rings (or fusellae), joined together to form a tube, and an outer strengthening layer (of cortical tissue) made of a criss-cross of bandages. One end of each theca (its aperture) was open to the sea, and it was in the thecae that the small animals (or zooids), lived. Nobody knows what they looked like, but it is likely that they caught microscopic food particles from the surrounding seawater by the use of feather-like arms. Cephalodiscus gracilis, a living pterobranch thought to be related to graptolites. Two zooids have extended their feathery filtering nets to feed. A reconstruction of a Geniculograptus in life, shows zooids secreting collagen and waving their feathery arms in the sea water as they feed (the part illustrated would be 6 mm long in life). Although graptolites are now extinct, living marine animals called pterobranchs appear to be closely related. Pterobranchs do not grow their tube-like skeleton in the same way as we grow our bones or an oyster makes its shell. Rather, the pterobranch zooids actively construct them, much as a spider weaves its web or termites build their nest. Graptolites probably did the same: the criss-crossing bandages in the outer layer of a theca, which look rather like the bandages wrapping an Egyptian mummy, were apparently 'trowelled' on by a secretory organ akin to that of pterobranchs. The earliest graptolites lived on the sea bed, attached to boulders (a) or forming upright cones rooted into soft mud (b). This is still the lifestyle of the living relatives of graptolites. At the beginning of the Ordovician period graptolites became free floating. They were amongst the first animals to colonise the open sea and were able to exploit enormous untapped reserves of food (single celled organisms) in the upper layers of the oceans. Different species evolved rapidly in order to exploit these food reserves and in response to the new challenge of a floating life. A view of the Silurian seas, showing a range of graptolite forms, including those fixed to the sea bed (a, b) and floating species (c–l). Graptolites were common where food was abundant, especially in upwelling zones where deep water is forced to the surface with its load of nutrients. Some were deep water specialists (c) whilst others were opportunists, seeking out temporary supplies of food (e, d). Using the distribution of fossil graptolites, we can begin to reconstruct the oceans in which they lived. Feeding: graptolites were most common and diverse where major upwelling currents brought nutrients from deep water into the shallows, in areas such as the tropics and at the edge of the continental shelf. Some colonies evolved into enormous harvesting arrays, capable of living to a significant age, perhaps up to 20 years (c). Others evolved into slim, short colonies (d, e) or into gently curved forms which rotated through the water as they fed (f, g). Floating: a floating life is a challenge, and graptolites responded to this by evolving a range of hydrodynamic strategies. Long nemas evolved to retard sinking (e, h) and hooks, spines and net forms appeared which would have had a high drag so that they moved slowly (i, j, k). The zooids may have helped the colony to move and possibly secreted gas or low-density fat to help the colony to rise through the water. Graptolites are excellent geological time-keepers, for they can be used to date the rocks in which they are found. They evolved quickly and assumed a wealth of easily recognisable shapes. Many of these evolutionary steps, which can be traced around much of the world, define periods of time. Some of these time-slices are only a few hundred thousand years long, which to a geologist, amounts to pinpoint accuracy given that all this took place hundreds of millions of years ago. Anisograptids such as Ordovician Clonograptus are transitional between dendroids and graptoloids. Most of these 'planktonc dendroids' had two types of theca, but fewer stipes. Dendroids first evolved in the Cambrian and lived rooted to the sea bed. Dendroids had two types of thecae, possibly for males and females. Graptoloids were all planktonic, had only one kind of theca and may have been hermaphrodites. Dichograptids flourished in the early Ordovician. Their stipes were few and arranged in various ways: e.g. stretched out sideways (horizontal), hanging down (pendant) or turned upwards (reclined). Diplograptids evolved from dichograptids in the Ordovician. Orthograptus and Dicranograptus are from the Ordovician of southern Scotland. One-stiped monograptids appeared at the beginning of the Silurian and evolved rapidly into many coiled, curved and straight species, with elongate, hooked or lobed thecae. Spirograptus turriculatus, Rastrites and Monograptus lobiferus are from the Silurian (Llandovery). The history of graptolites (dendroids and graptoloids) and their diversity related to global events. The geological position of illustrated specimens are shown in italics. Palaeozoic rocks of the UK and some good places to look for graptolites (see black spots). The colour code for geological periods is the same as for the history diagram. On death graptolites fell to the sea floor, became entombed into the sea floor muds and, if conditions were right, preserved as fossils for us to find today. They are found only in Palaeozoic rocks such as those in Scotland, Wales and north-western England. The oldest dendroids occur in Middle Cambrian rocks, but they can be found in rocks as young as the Carboniferous. Planktonic graptolites are particularly common in Ordovician and Silurian shales and mudstones. Graptolites are thought to have been hermaphroditic — with both male and female sexual organs. To avoid self-fertilisation, or inbreeding, zooids could have had the potential to be temporarily male, female or neuter. Zooids maturing at the near end of a colony might initially have been males whilst those occupying the larger, distal thecae may have manifested the female phase. But nobody knows for sure! Schoolteacher Charles Lapworth (1842–1920) wandered over the Scottish Southern Uplands in his spare time. He found that the graptolites showed a distinctive pattern of evolution. Even more remarkable was that this pattern was repeated many times in the rock strata across the Uplands. He thus deduced that the rock sequence had been repeated too by mighty mountian-building events and established the use of graptolites as geological time-keepers. Most roofing slates in Britain, from Wales, the Lake District or Scotland, were once sea floor muds in which graptolites were entombed. Most roofing slates in Britain, from Wales, the Lake District or Scotland, were once sea floor muds in which graptolites were entombed. But don't break up your roof to have a look. Any graptolites are likely to be pretty squashed anyway. Better to look for graptolites in the (less squashed) mudrocks of Hartfell Spa in Scotland or Abereiddy Bay in South Wales, for example. These graptolites have been crumpled up before they came to be buried in the muds of a Silurian sea floor. These graptolites have been crumpled up before they came to be buried in the muds of a Silurian sea floor. Something had attacked and eaten them — but what? The mysterious predator didn't have sharp teeth, as the graptolite hasn't been torn or shredded. We still don't know what it was — maybe it was a soft-bodied organism that simply was never preserved.